Fat Bruce Lee, Chi Burger, and I were idly hanging out at the world headquarters when the "red phone" rang. This could have meant one of two things. Either we were going to receive instructions to deploy the nukes, or one of the restaurants, which we had previously reviewed, was calling to ask us to re-sample an updated burger. Fortunately for all of us, it was the latter. 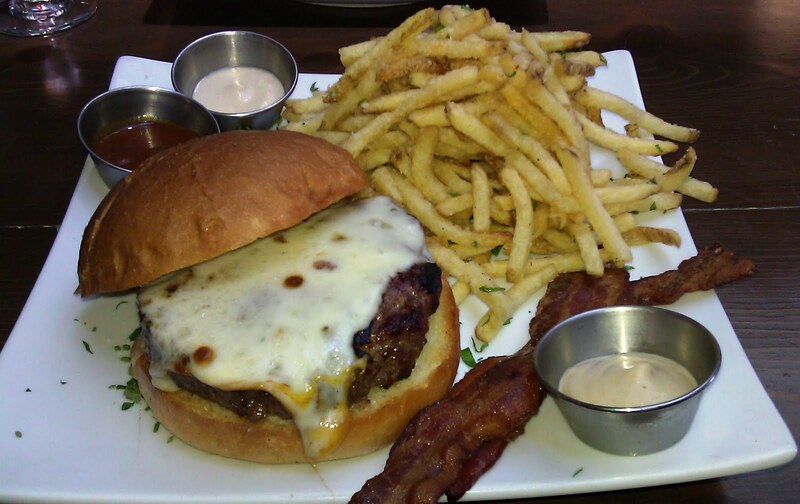 Abbey Berookhim, Director of Operations, for Steingarten L.A. asked us to swing by and try their updated burger. On our previous visit, the bun was a major distraction, and the restaurant had finally settled on a new bun. They had already gone through 4 bun vendors prior to our last visit. Abbey was confident that the new bun from Melrose Bakery was a winner. Previously, Mr. Berookhim had opened the downtown LA spot, Olive Tree, which catered school lunches and served the office crowd at lunch. Olive Tree went the way of the dinosaurs when the city of Los Angeles exercised imminent domain and forced the caterer off of the property to make way for a Cal Trans building. The concept behind Steingarten L.A. was California Beer Garden. The hokey, pseudo-Teutonic caricatures of German Biergartens were played out, and Steingarten L.A. chose an updated, subdued path. Long tables, ample outdoor seating, a high retractable ceiling, an enormous selection of craft beers (120...20 on tap), and a sausage-packed menu (24 types) were all elements which substantiated the Biergarten concept. Lacking were cuckoo clocks, yodeling, dirndls, and lederhosen. As the son of FOB German parents, I found the environment refreshing and more in keeping with the Germany that I grew up with. After about 10 minutes our cheeseburgers arrived. The Beef: The beef was identical to what we had tried on the previous visit. This was wet-aged, 90:10 Sirloin. This was an all-natural, grass-fed beef from IDB. 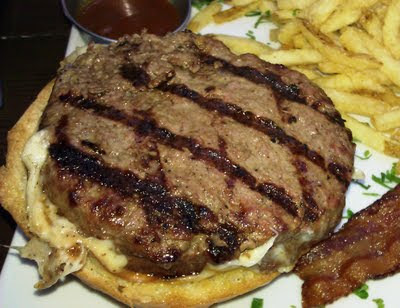 The burger meat arrived pre-ground, and it was formed into 8-ounce patties each morning. These burgers were wonderfully beefy and juicy. The Sirloin tasted of steak, blood, and minerals. There was a faint trace of aging. Steingarten L.A.'s beef was nearly perfect. The Seasoning: As before, the exterior of the patties was perfectly seasoned with salt and pepper. This seasoning combined with the blood and juices of the ground Sirloin to create a wonderfully beefy and complex bite. The Sear: The burgers were cooked on a very hot gas grill. The burgers picked up some grill marks, but a proper sear was not developed. In this case, the quality of the beef and the seasonings made up for the lack of sear. The Preparation: The beef was delivered pre-ground at a medium setting. The fineness of the grind compensated perfectly for the lean beef. The mouth feel was lush--a difficult thing to accomplish with a low fat content. The burgers were formed by hand each morning and as needed throughout the day. The burgers were packed loosely and handled with care. As a result, the bite was very juicy and tender. Our burgers came out perfectly Med-Rare. 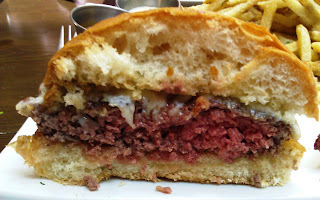 I was pleased to see that Steingarten L.A. used a broiler unit to melt the cheese evenly over the burger patties. 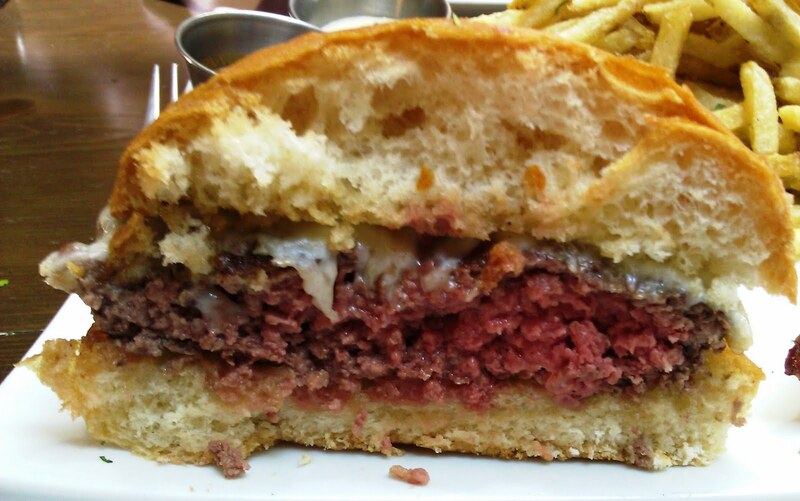 The Cheese: On this visit, I ordered my burger (Chef's Choice) with the Smoked Mozzarella. This was a happy choice. The Mozzarella was creamy, smoky, savory, and perfectly melted. The cheese rounded out the bite with smokiness and umami. The Bun: The burger buns at Steingarten L.A. were delivered fresh daily by Melrose Baking Company. This was a French burger bun. The bun appeared a bit daunting, and it felt a little tough as I cut through it. Fortunately, when I bit into it, all of my concerns were allayed. The bun was an excellent match for the tender, juicy, burger patty. The skin of the bun was savory, and the interior was moist and yielding. The flavor was quite neutral. This bun was excellent in the area of juice retention. The bottom bun captured all of the juices from the burger patty, but it did not become sodden. The bun was also very nicely toasted, and it delivered some crunch to the party. We also sampled the soft pretzels...these were exceptional. The pretzels were glazed with a salty egg wash in lieu of the standard rock salt crust. This was a pleasantly refined departure from the standard. The Fries: The fries were identical to what we had sampled on our previous visit. The skinny fries were cut in-house, par-cooked, and dried prior to cooking in canola oil (soy oil upon request). The peel-on fries were delicious and perfectly seasoned. The Parmesan fries were even better. Steingarten L.A. used a premium, aged Parmesan, and it was splendid. Fat Bruce Lee was equally pleased with his choice of sweet potato fries. The Toppings: The Romaine lettuce was fresh and crisp, and the juicy, fresh tomato slices were lightly salted. The sauces all tasted authentically German. The curry sauce and mustards were exceptional. The bacon, which accompanied the Chef's Choice burger was crisp and meaty. The Sausages: We had the opportunity to sample Steingarten's one-of-a-kind Alaskan Wild Salmon Sausage on a well-executed pretzel bun. This was quite good (in a fish cake sort of way), and it certainly had the merit of novelty. It was a rare treat to try a dish, which we had never before seen on a menu. It actually tasted healthy. Happy Meal and I returned a few days later to sample the Bratwurst ($6.50). The German sausages on the menu were picked up from a purveyor in Burbank. After we took our first bite, we appreciated why Steingarten L.A. selected that purveyor. The Bratwursts were splendid. Happy Meal just grunted with delight as he attacked his. 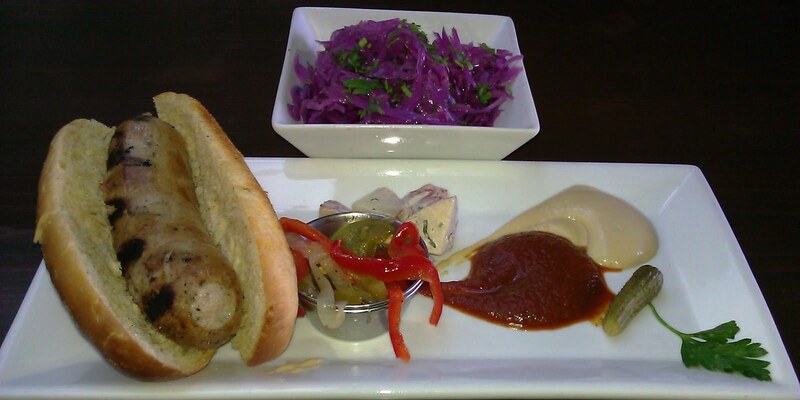 The sausage was mild, juicy, and full of a kind or creamy goodness only found in exceptional Bratwurst. The German mustard matched the bite perfectly. I broke with tradition, and ordered mine on a pretzel bun. The salt-glazed bun was tender and chewy. I worked with the tender sausage. There were a variety of topping available, but I saw no need to tinker with perfection. Beers: First, Chi Burger ordered something, which was heavy on the cherry flavor. It was a refreshing beer, which tasted like a slightly tarter version of a Berliner Weisse. This was one of my favorites from Berlin--a pint of sour, wheat beer with a shot of raspberry syrup. Bonus, one drank it using a straw! 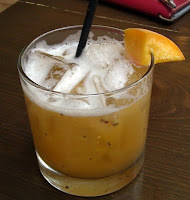 Next, Chi Burger sampled something called the Peach Belle. This was a peach beer blended with fresh peaches from a Japanese orchard. There was also an assortment of fresh herbs in the beverage. This was just like drinking a garden. I have never before tasted beer that seemed so healthy. Fat Bruce Lee was tempted to go for a run after two sips. The bar staff was incredibly knowledgeable and helpful when it came to the beer selection and pairings. With 120 beer choices, an expert staff took the guess work out of ordering the right beer. The Value: It was $14 for the Chef's Choice burger, and the meal came with a generous portion of fries. I barely put a dent in mine. The value was quite good a Steingarten L.A. The beef at Steingarten L.A. was a superstar. The new bun was a perfect match. The cheeses, which we have tried, have all been solid. The fries were exceptional. The burger here was a solid winner. I was pleased that the restaurant was close to my home. If you don't want a burger, get one of the amazing Bratwursts. Burger Review : A wonderfully flavorful and well-executed burger made from exceptional ingredients....all for a reasonable price. Cant wait to try this place!! !